The Parr family is back!! And it took them fourteen whole years to return to the big Screens. We were all dying to know what happens to the Parrs after the events of The Incredibles. With the sequel finally hitting theaters in a few months, the wait is over. The trailer was released not long ago and it showed us The Incredibles 2 is taking the Mom on Top route. ElastiGirl is all set to to make her return as a superhero as Bob stays home, as the literal man of the house. While the trailer did show Underminer trying to act all cool and evil, we at Xtrascoop beg to differ about him being the true villain of the movie. The trailer could have revealed something else, someone else, that could be even more sinister. So the question is – Did it? Did The Incredibles 2 trailer secretly reveal the True Villain of the movie??? Meet Bob Odenkirk. Odenkirk plays Winston Deavor in the sequel. Deavor is the ‘nice guy’ businessman who wants to use Elastigirl as the object of a Public Relations Campaign to bring back Superheroes into the mainstream. His objective is simple – make superheroes cool again. But if you have watched the first movie, you will start seeing a pattern here. Syndrome, the villain in The Incredibles, also believed Superheroes were cool until he was rejected by Mr. Incredible himself. Deavor, my friends, could be the actual bad guy of The Incredibles 2, given his uncalled for fascination with superheroes when the rest of the world doesn’t give a shmuck about them. I see red, I ring the bell! Ding Ding Ding!! Wake up and smell the pie Mr. and Mrs. Parr!!! 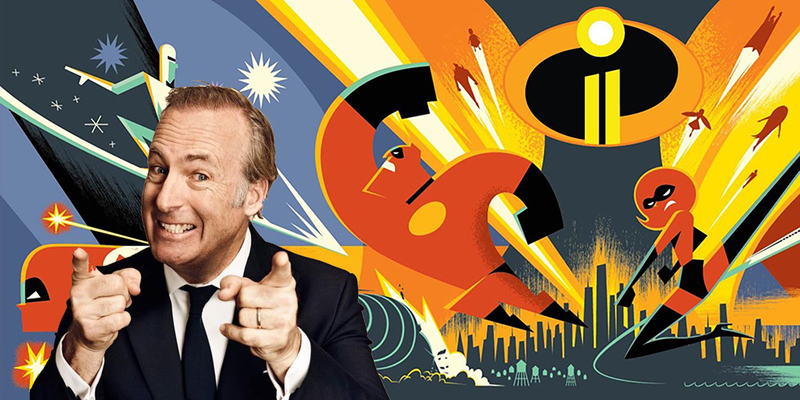 Odenkirk tells the fans in an interview with Cinemablend that he could be voicing the villain. Many of you do not know but The incredibles does have a comic book series. One of the characters from the series is Xerek, Elastigirl’s ex-boyfriend. Xerek played a huge role in the earlier drafts of The Incredibles. He was to play the part of the villain, a role that was then chosen to be played by Syndrome. We still don’t know what the connection between Xerek and Winston is (he sounded as if he were joking). But since The Incredibles still is superhero fiction, we always have to assume the worst and hope for the best. What do you think? Is Winston Deavor and not Underminer the true Villain of the movie?? Only time will tell….